The day has come! Our kitchen renovation is finished 7 weeks after we started tearing out our old tile countertops and I can’t wait to share with you photos of what it looks like today. I’ve put all the sources at the bottom of the post for your convenience. When we moved into our home two years ago (almost exactly!) we immediately started making plans to transform the kitchen. At first, we just talked about it, and then we started drawing out plans. They changed over and over. We moved the pantry cabinet out of the dining room and rearranged what we had to tide us over. It was all a part of the process. There were a few major floor plan changes, including moving the laundry room so we could add a walk-in pantry to the kitchen (and accompanying pocket door!). Recessing the wall where our all-refrigerator sits really keeps the whole kitchen feeling open, and adding new windows floods the room with light. Nixing upper cabinets for reclaimed open shelving keeps the kitchen feeling light even though we opted for black Ikea cabinetry (the LAXARBY finish). The DIYed white concrete countertops for the perimeter of the kitchen juxtaposed with the warm, chunky black walnut island top is one of our favorite parts. In our last home’s kitchen, we went for one big deep sink tub, but since we regularly hand wash knives, certain pots and a few serving dishes, I missed having two tubs! We love this sink, where the left side is just barely larger, mixed with Delta’s Touch2O Trinsic faucet–it’s a match made in sink heaven. I love injecting a few sources of light into every space. In here, we added recessed lights, two pendants over the island, a sconce over each window and come evening, we even turn on the hood lights. They all work together so well and make everything feel comfortable. Of course, the real stars of the kitchen are the appliances. We have a whole post scheduled for next week (including video!) highlighting them, but we couldn’t be happier with the way the Frigidaire Professional collection made our vision for a home chef’s kitchen, a reality. 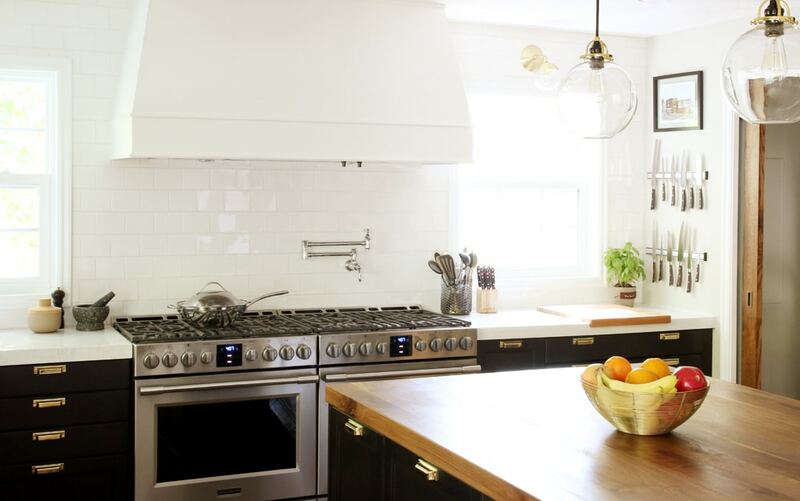 As it turns out, putting two 30″ gas ranges side by side could have been our best idea yet. It really has amped up the look of the kitchen and Chris is already cooking up a storm. We’ll give you a peek into the pantry where our all-freezer sits next week, but we love so much space in our all-refrigerator, to store the food we use most, right at arm’s reach. Growing up, my Grandma Capone always rang the dinner bell when it was time to come eat. Now that it feels like home here, I wanted to include one in our kitchen, too. I thought I’d include a couple real-life evening shots in this post so you can see what dinner prep looks like on an ordinary night in the new kitchen. Lastly, we wanted to say how grateful we are for all of your support and encouragement during this 7-week process. We feel so blessed to be able to completely renovate our kitchen and add on all of your good vibes and comments–we’re over the moon. Thank you, thank you for letting us share this with you. To see more photos of the kitchen, the breakdown of the layout and functionality and even a video of everything in action, see this follow-up post! Miss a part of the process? Click here to see all the posts covering this renovation! Amazing!! It’s like you crawled into my brain and made my dream kitchen!!! I am so in love!!! Your list of where you found everything was so helpful!! If you are in the market for a new bestie.. I’m available!! How are your concrete counters holding up now that it has been a few years? So good. We still love them! We are looking into a freezerless refrigerator just like you. However, we use our water dispenser and ice a lot. What is your solution to getting ice and water for drinks? Our kitchen’s freezer (in the pantry) has an ice maker in it and we have a whole house water filtration system so the tap water is great for us. Love this kitchen! How many feet did you leave between the island and cabinetry? Curious how the counter is, 3 years later?? Its so beautiful btw! We love it! Still one of the best things we’ve done for our home. I recently poured white concrete counters myself. Just sealed them last week as a matter of fact. How have they held up for you after these years? Any staining pr issues you’ve run into? No staining, but the sealer has chipped in a couple places. We’re due for some touch-ups. Can you relink the walnut island top? The link attached is not working. They are from Craft Art. This is AMAZING!!! We’re about a month away from moving into our first home. It’s a fixer in LA, and we’re doing a significant remodel. Thank you for sharing your process and giving us hope that ours will turn out just as beautifully! Hi! I’ve been a long time follower of yours and love this kitchen. We are installing a new kitchen and have a vent hood insert that will be under a decorative hood kinda like yours but not double width. However, it is wider than the insert itself. Would it be possible for you to email a photo that shows the under side of the hood and how it’s secured in there? I’d really appreciate it! Love this! Can you tell me where you found wood to fit in your shelf brackets. We just bought the same brackets and are having a heck of a time finding wood that is a true 1 in and will fit snuggly. Help! We went to a local lumber yard and picked out some old reclaimed wood, then had them plane it down to the correct dimensions. It was a 48in Electrolux, but they actually don’t make it anymore. Can you send me a pic of the walk-in pantry please, thanx. All the pictures we have are on the blog! Hopefully they give you the info you need! I am currently building a house and the kitchen cabinets have been such a hot topic. Ikea or custom cabinets? I am really curious to know how you feel about your cabinets after using them for a couple of years? Have they held up well? Would you use Ikea again? They’re doing great! We used a good sealer that has prevented stains, except in a few places where the sealer has chipped. And even then it’s not so much stains as just some general discoloration. We’ve had the countertops for over 2 years now, so I think we’re just due for a quick reseal in a few places. All things considered, though, we would do these countertops again and again. They’re excellent. Have you resealed your concrete counters again? My husband and I love these countertops and are planing on doing them in our “new to us” home. 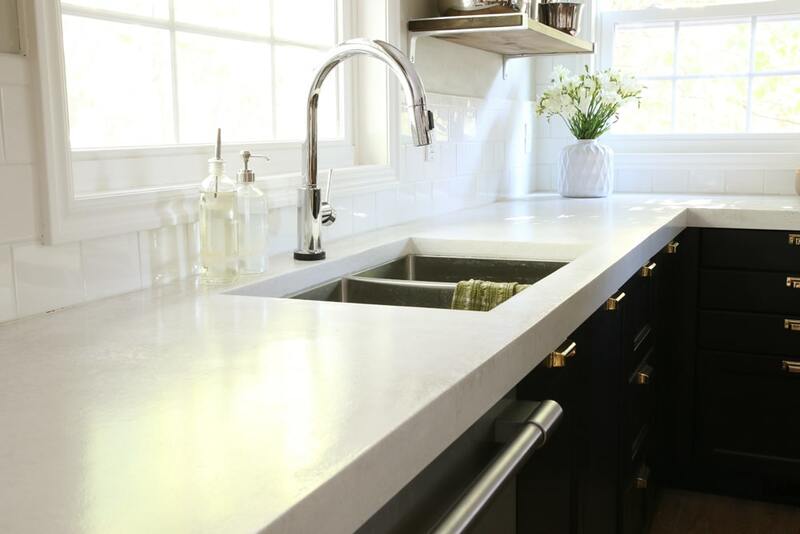 I would love to see how you reseal and maintain these beautiful countertops. Thank you so much, I just love you two and your podcast!! Could you direct me to where you ordered your wood counter top? Also is your pantry door a sliding door? 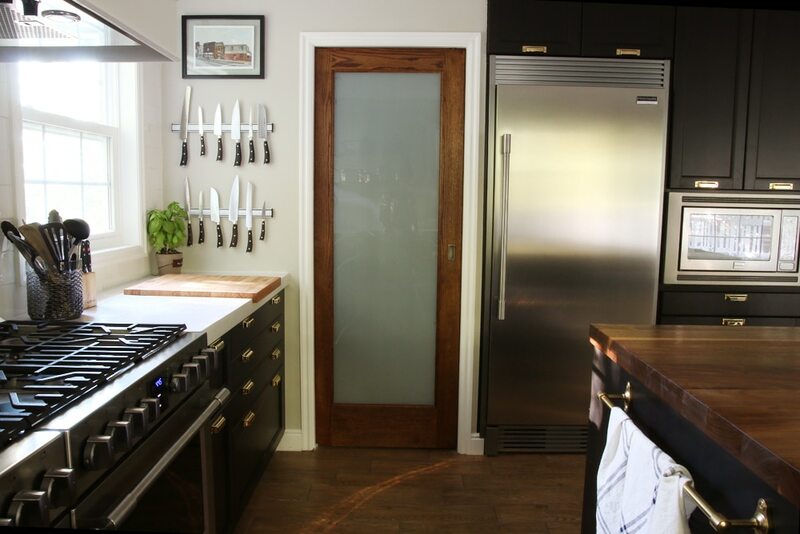 The butcher block is from Craft Art, and the pantry door is a pocket door. And we actually swapped out the door on the other side to make it a pantry door as well. I love this, planning to do my sink counter top white, although the price may carry because am in Uganda, and I may not have some of the supply you guys have. but will try posting the finished product. love this. Hi! I absolutely love your kitchen runner and have been trying to find a good one on ebay & etsy for ages. Can you let me know which ebay vendor you bought from? :) Thanks! Oh darn, we don’t remember which one it was. Sorry! Love this! How did you get cabinets over the fridge? I want this fridge but it’s 32” and ikea only does 30” or 36” cabinets. We got the 36″ cabinets and put the fridge surround pieces around it and it worked perfect. I absolutely love your new kitchen ( I just found you) and the rest of the house. We are building and I’m stealing the fridge only idea. My plan was for a separate 36″ cooktop only and double oven/Conv/micro combo but the double range you did has me intrigued! Do you still love it after a few years? Not sure since there’s only two of us if that would be worth it day to day. Do you entertain or have gathering often where it is utilized more? Thanks for all your post my brain is full of ideas for my next 8months and beyond! We entertain a bunch, and both have large families so the double ovens have been amazing. We’re so happy we did that! Hi Julia! I adore your kitchen and have had it bookmarked for years. We are using IKEA cabs and the same Frigidaire All-Fridge in our new kitchen (you inspired us!) I was wondering how you were able to put upper cabinets over your All-Fridge without using any filler pieces. The options for IKEA Sektion uppers are 30″ or 36″, but yours appear to fit perfectly over the 32″ fridge. We’re using the same trim kit you are, which, according to the specs, doesn’t add width to the fridge, only height. If you could share any insights on how you achieved this seamless look with no fillers, I’d really appreciate it. Thanks! There’s an over-the-fridge cabinet, specifically, that we used. I’m running in to the same problem as Jennifer. We are designing our kitchen (100% inspired by yours!!) but cannot figure out the over the fridge cabinet situation. If your ceilings are 96″ (you’ve said they’re standard 8′ ceilings so I’m assuming), the fridge is 79″ with full trim kit, that leaves 17″ for the over-the-fridge cabinets, which they don’t offer. Or if you use frigidaire’s 75″ trim option, that leaves 21″ for the over-the-fridge-cabinet, which is also not an option. The over-the-fridge cabinet options IKEA sells are 15″ high and 20″ high. Looks like maaaaybe you guys got the 20″ high cabinet and trimmed it out at the top with a thin crown moulding?? It’s hard to tell in the pictures. Is that right? Would love to know – your kitchen is inspiring so many of us, we just gotta know how to make it as good! thanks so much in advance!! We got the 15″ cabinet and added a little bit of crown at the top. Can you please tell me more about your range hood? I love it, and want to know how to get something like this in my kitchen! My husband and I are looking at renovating the kitchen in the house we are looking to buy, we just completed the kitchen at our current house 3 years ago with IKEA’s older system. I really like the look of the Laxarby Doors in pictures but when i saw them in the showroom, them seemed dull and some of the fronts were not even stained/finished completely. i didn’t know if this was just from it being in the show room or how the product would be. In the pictures your cabinet fronts looks more like a satin finish that the matte looking ones we saw in the store. Are you happy with the finish and construction of these cabinet fronts? We LOVE them. They are definitely more satin black. I love, love, love the space. We are in the process of renovating our kitchen. I am dreaming of black cabinets but have been told that they are always dusty and always look dirty. Do you agree? Dream kitchen! I love the side by side ovens. Was it difficult to deal with splitting the gas line or did you have two put in? This kitchen is gorgeous! Every detail. And I soooo want side by side stoves. One seriously isn’t enough. Quick question – that is literally my dream rug on your floor. The perfect level of wear and fading on it. Do you remember what ebay seller you worked with? If you could share the deets, I’d be so grateful. Thank you! Beautiful kitchen, with white, make the kitchen became more bright and clean. Fabulous job!!! Hi! This is so beautiful! I can’t find much info about WHITE concrete countertops. Just curious how it’s holding up now and if you have staining from oil, water, acids, etc. All the feedback I’ve found is regarding gray but I’d prefer to use white and just want to compare what I should expect and to see if the dealer you used makes a big difference considering it’s much more expensive than other options. Thanks in advance! Hi I love love this kitchen please tell me where are the hardware from???? 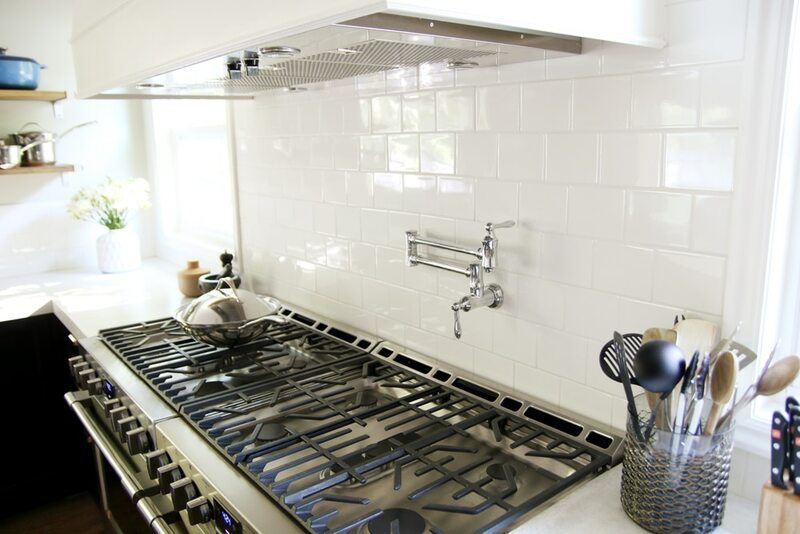 SO beautiful, Can you share any info on your range hood? Did you have to do anything special for the installation of the two ranges side by side. I am in the process of building a new home and have designed my kitchen with these ranges installed side by side exactly like in your awesome kitchen. The frigidaire rep is telling my salesman that these ranges are not UL listed for sid by side installation, and that they can not recommend installing them next to each other. Are you still happy with the ranges and have you had any issues with them installed side by side? Where is the kitchen sink from? Beautiful kitchen! Just curious, where did you put your freezer? It’s in the walk-in pantry! Check it out in this post. Please add this to the house tour!!!!!!! Yes I’m begging haha. I went to the young house love podcast page and the new one hadn’t dropped yet. So I remember they said “Chris Loves Julia” has a podcast – so I ran to check it out and promptly listened to the no money no problems podcast where you discuss cheap or free ideas – like your cost effective white concrete countertops, so I run to your home tour page (we are sitting on the materials to do our kitchen) and it’s not there :-( I finally find it after searching but then have to get back to work, so I finally found this one – the reveal – after more digging, 6 hours later! Please update your house tour page. You can even do a post about crazy demanding readers like me. We’d all love it! Amazing! Hahahaha I’m on it. how thick is the counter and what is the overhang? Also, how thick is the countertop? 1.5 inches? Can you provide some dimensions of the kitchen? -Prior to renovation, wdth (from mirror wall to opposite wall)? -After renovation; from back wall of range to end of island (where two stools are)? My boyfriend and I bought a house a couple months back and we decided to do a gut job in the kitchen (The before was….quite something!). We didn’t wan’t to spend too much on the project because it’s our first house and we don’t have that much money on hand. For that reason, we decided to look at Ikea. At first, I wanted a white kitchen. Yet, I was unhappy with what I saw….and that’s when I stumbled across the Ikea Laxarby cabinets! Wow! Such an eyestopper. I started thinking about it, changing my plans on the ikea kitchen planner, and I also started look for pictures online. I think I can say that stumbling across your kitchen design convinced me that I was making the right decision with the Laxarby cabinets! Oh my goodness!! I am so in love with your kitchen! I have searched the Internet for months going to Houzz, and other sites, but yours is the perfect blend of what I like! Bravo!! It’s ALSO the only kitchen my husband and I agree on, and that’s a miracle! I am going to be using your kitchen as inspiration for our future reno project. Awesome! Best of luck to you in your reno! 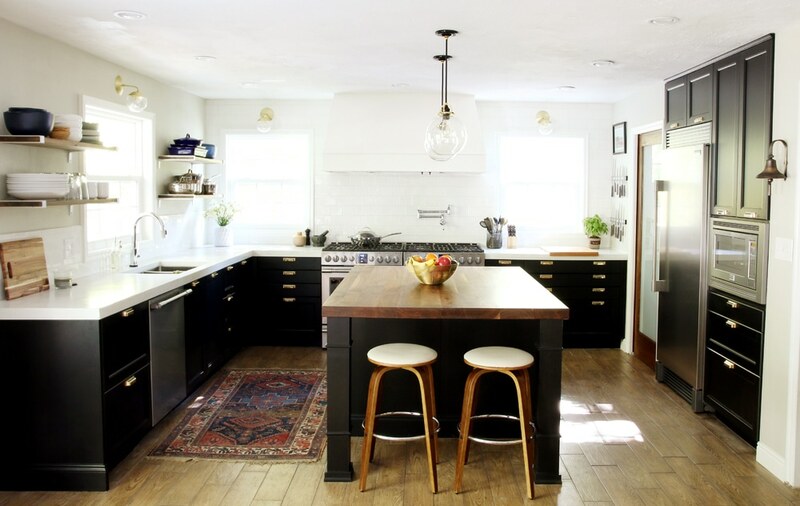 Beautiful kitchen makeover! What was the sealer you ended up using on the concrete countertops? 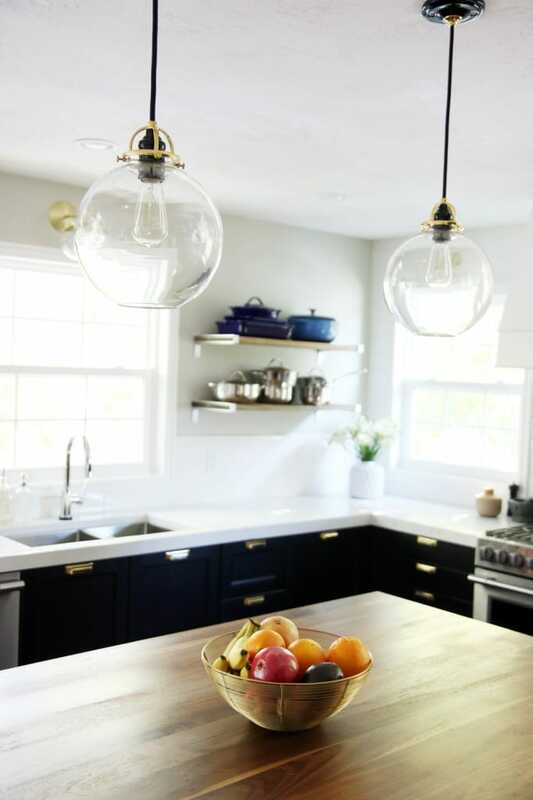 Love your kitchen, and especially the brass pulls! It looks like your faucet is stainless steel instead of brass. Can you take me through this decision? 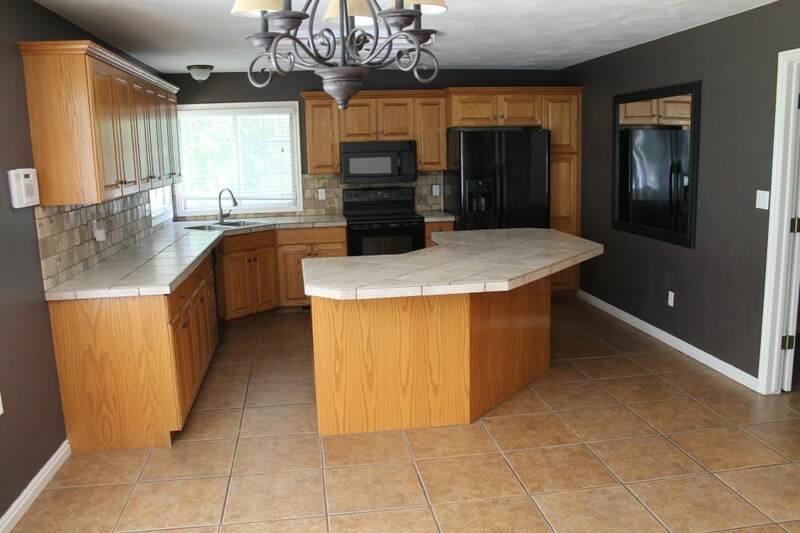 I’m currently thinking debating which color to us on my own kitchen. Love it.. I am in the finishing stages of my Family Room and kitchen addition/remodel and my budget was running low for my counters, started doing research on the concrete and came across your page, thank you for sharing and for making it easier for me to complete this huge project. As far as the kitchen cabinets i also went with IKEA, its the second kitchen remodel i have done using their cabinets and to this date never had a problem, trust me i have 3 young daughters banging pots and pans all over. maybe i can share my project with you so i can have some pointers. Thank you soooo much. Just wondering the dimensions of the kitchen as well as the dimensions of your island? What a beautiful kitchen! Can I ask what kind of hood fan you used? We used a 48″ Electrolux remote blower (the fan is up in the attic) so it’s not too loud. Your kitchen is beautiful! Can I ask what your overall budget was for the renovation? I’d love to see a budget post showing where the money was spent. I wouldn’t normally ask that kind of personal question, but I just love this and am wondering if we could do something similar in our home. Thanks so much for sharing! We got that question a few times just today! Although it’s 6 months later, we’ll definitely put together a budget breakdown in an upcoming post. It was around $25K though. Beautiful kitchen…can I ask, did you purchase the 3 inch or 4 inch pulls from Rejuvination? My husband was concerned that the door and drawer fronts weren’t sturdy enough with only the thin panel in the middle. Have you found the Laxarby fronts to be solid and sturdy or do they kinda wobble? These are extremely heavy and sturdy cabinet fronts. No concerns or issues whatsoever. Naomi, my husband said the same thing — I was completely set on LAXARBY (based on this blog) until we opened and closed the drawers and cabinets in person at the IKEA showroom. My husband kept “knocking” on the doors to demonstrate how hollow they sounded compared to the other doors. I wonder if their manufacturer or production line changed? We were sad and disheartened as well since we were ready to pull the trigger until discovering this. (Seems that no one else has the same complaint online though(?) Every mention of LAXARBY seems to be positive). My wife and I are building a new home and were going to do two wall ovens next to each other with a cooktop above them. That was unique enough and we’ve had a lot of weird looks from sales people when we tell them what we’re doing. Then we saw the same Frigidaire ranges as you put in and had the same crazy idea as you. I’m so glad I found your blog. It has made me think we’re more genius than mad scientist. Any thoughts on your ranges now that you’ve had time to use them? We’re in the middle of a remodel of our Farmhaus and plan to do dark/black cabinets. How do you like the black on the Ikea doors? Technically, I think they call it brown/black. I’m looking at other cabinet options to find a more true black, but I love the price and ease of assembly of Ikea cabinets. Now that you’ve been living with your kitchen for a while and have seen it in different light settings, how do you feel about the color? Black enough? I don’t even know why they say Brown/Black. Haha. Truly! They are black. They are a warm black, which I love, but 100% black. For sure. Do you happen to have a suggestion for a paint color that would match well with Laxarby cabinets? We have a magnetic knife rack, also. In our current house, I have all these tears in the latex paint from the knives being pulled off or put on. I don’t remember there being a problem in our old row-house back east. We are about to remodel our kitchen and I was wondering if you had any problems with the knives nicking the paint? and if so, have you a solution? Sorry if this has already been asked…. But can I have the island sources? 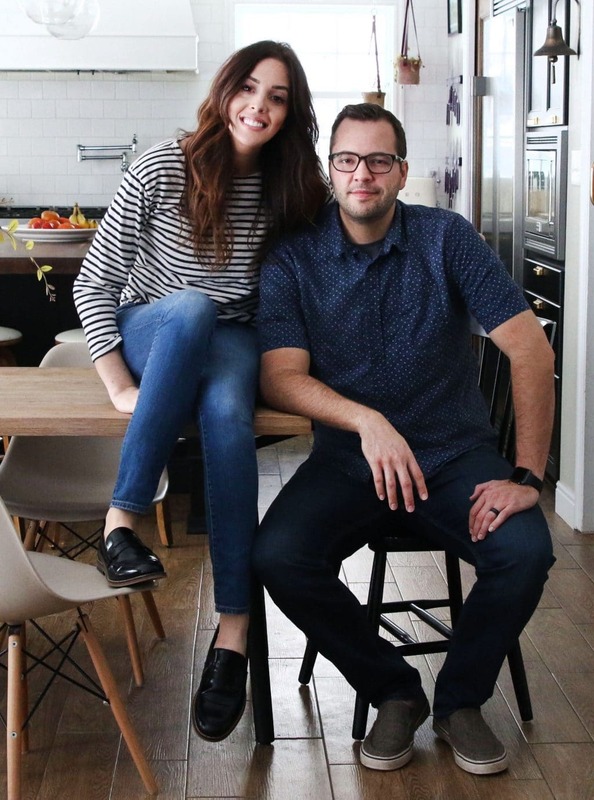 Hi Chris and Julia – I love the minimal details on your range hood and I’ve looked but am not seeing a post specifically on it. I’d love to see one if it exists! The kitchen looks fantastic – I know you are enjoying it! Incredible! I am blown away by your talent! We are in the process of planning a new kitchen. Would you mind sharing your original kitchen dimensions? Thanks for the inspiration! I am amazed by your kitchen! I love Ikea, being a swede and all, but I never knew an Ikea kitchen could look this good :) I renovated my parents kitchen this summer and used the same style, black lowers and white uppers, mostly because it meant I could reuse the cabinet doors already in place. Found your blog while researching concrete counter tops and realized that this kitchen is like the prettier big sister to the kitchen I built! What size did you chose for your cabinet hardware? It look bigger than the 3 inches that you link brings me to. These are the 4″ ones. You should be able to select size on that same page. I just love your work! I just found you and spent the whole weekend devouring each room and project. I am so thankful for how thorough you are in giving details for each step of your projects. It really makes me think “we could do that!” So, our kitchen is an almost identical layout and we have some money set aside to start a remodel soon. I had already planned to do ours very similarly to yours so you can imagine how excited I was to find your kitchen to use as an inspiration kitchen! One question I have as I do my planning is how much room you left around the island (between it and the wall cabinets, fridge, etc). I want my island as big as possible but don’t want to be banging doors against each other or have too little space for two cooks to pass by each other. Your spacing looks very functional for that sort of thing. Thanks for all your inspirations! Oh my goshhhhhhhhhhhh I love it. My husband and I are 2 weeks into massively renovating a 100 year old farmhouse, and are in the kitchen design phase (among other phases). I will die and go to heaven if my before and afters are as amazing as yours! Found your site on another, those black cabinets look incredible! Wish I had the time for a kitchen makeover. I’d probably follow yours to the tee. Love the pendant lights as well! INCREDIBLE!! I love every single material, layout, accessory, styling choice you guys made. It’s absolutely stunning!!! We are dreaming of our full kitchen remodel, but for now trying to make phase 1 updates. There is carpet in the kitchen and dining room (ugh I HATE IT), and I want it gone now, but worry about making ti work later when we eventually rip out the kitchen. I don’t want to pay for something twice. How did you go about doing tile in your kitchen and then changing the floor plan? you were able to make the necessary updates when you ripped out the old cabinets and then put the new cabinets on top?? When we did the floors, we removed the island, tiled and then put it temporarily back in place. But we didn’t remove the perimeter cabinets until this renovation started. We patched the flooring there and where we took the walls down during this final renovation phase. Beautiful, Beautiful kitchen! What a great job! Hope your family makes many warm memories in it! The dinner bell is charming — would you share the resource for it? It’s from Rejuvenation! Check out today’s post for a direct link and a giveaway! Wow, looks amazing! What a difference. Love that rug too? would you mind sharing the source? And gosh, I hope my Corian/gas range comment didn’t sound snarky. It wasn’t intended as a criticism; just meant to be part of the conversation…sorry! If you’re ever in VT, come visit and try our GE profile all-induction range. I too have spent time in professional kitchens, and swore I would never leave gas, and now I’m a total convert right down to the instant responsiveness. (They don’t pay me to say this stuff, either.) But that’s after years in Brooklyn where gas in the summer was Just. So. HOT. You don’t have that problem. And I have to admit, looking at your setup, I wondered whether I could get away with a gas range next to an induction range… Grilling indoors plus no heat from burners when necessary – a girl can dream! Congrats again on the gorgeous and well thought out space. I’ve been working on a huge project and saved this to read when I was done. W o w. Congratulations is inadequate, but…congratulations! What amazing beauty and function…and I love seeing all this in the home of a family who (like us) has food, family and friends at the center of their lives and who will USE their kitchen. We chose much the same colors for our kitchen refresh, but I dream of, someday, an actual redo…making many of the same choices right down to the double range idea (although I will never give up white Corian at this point [well, actually, maybe I will after seeing your white concrete ones], and after three years of living with induction, I can say that for me, I wouldn’t go back to gas…not a popular statement, I know, but there you are). 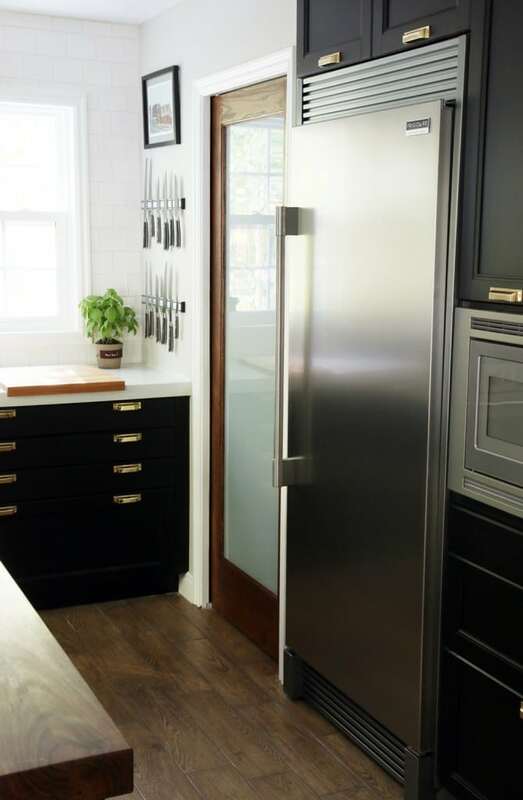 I’m particularly enamored of the huge fridge in main working area and freezer in pantry choice and am eagerly looking forward to the appliance post! Meanwhile, would you be willing to share the name of the eBay seller from whom you got that amazing rug? Thanks! Love love love!! I have come back probably 10 times a day to just stare at how pretty it is!! I LOVE the mixed metals! We are currently doing a mini kitchen reno and I’m doing brushed brass pulls with a stainless sink and black appliances (we wouldn’t get our money back from upgrading to stainless and we wont be here long enough to care. sigh.) I absolutely love the island, but the concrete counters have my heart! We did a concrete overlay on ours and sadly the seal didn’t work 100%. So now I’ve got to do some more layers and seal it, and then do wax over that and then they will be shiny and again, ugh. Everything turned out perfect for you guys! You are professional! My question, and it’s so random, is what happened with the grout? I know it was lighter than you had wanted, but in these pictures it doesn’t stand out at all! Beautiful! It has such a warm and cozy feeling to it! It looks so good!!! I actually said I was jealous out loud to myself while reading your post lol! I just love the timeless look but also the functionality. Can’t wait to see the pantry! I bet you are having fun filling it up! I think I composed the sentence about the pantry wrong in this post because so many people have reached out excited to see the pantry. We actually haven’t even started the pantry yet. I mean, it has walls and baseboards and it’s painted, but I was just planning on sharing a photo of how the freezer is in there. We are starting in there now, but wanted to wait until the kitchen was done to give it our full attention. Love this! 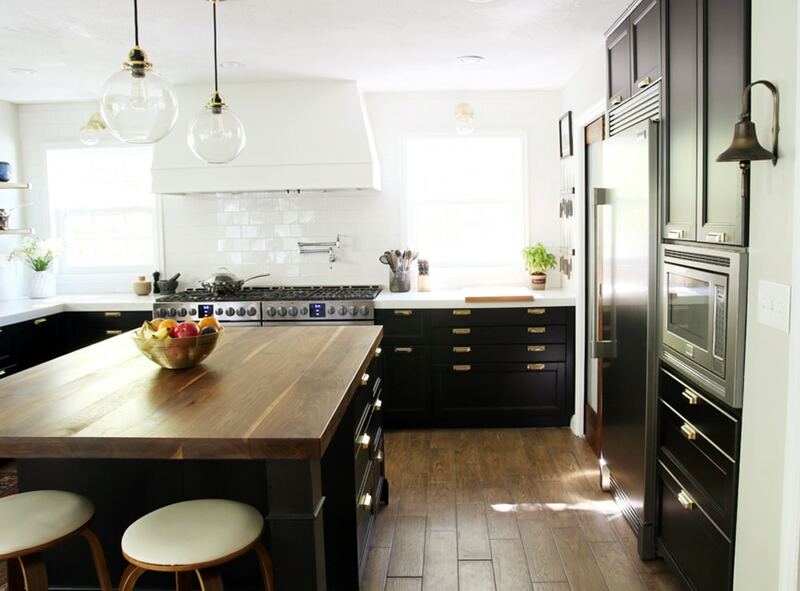 Especially digging the black cabinets; we’re planning on going navy so I like seeing other dark cabs. Wow! Your kitchen is gorgeous! I’m still totally impressed with how fast you finished the renovation. Happy cooking! 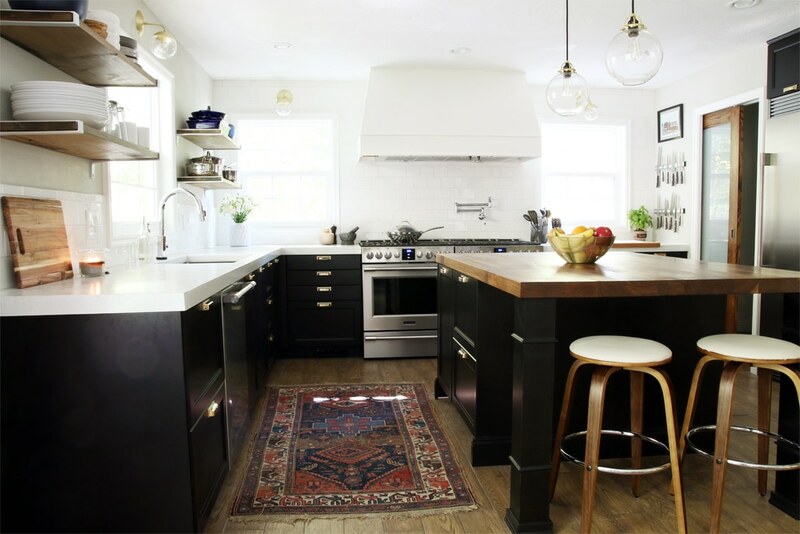 Love the kitchen and your blog! I found it just in time, as we start our kitchen remodel this weekend… we are also planning on doing concrete counters in white and your post has convinced us that the z countertop’s white mix is the way to go. Although it still comes in at a good price, our quote for shipping matched the cost of product. Were they able to work with you at all on the shipping prices? They swivel like there’s no tomorrow. The reveal made me emotional. I FEEL the love and warmth in the space. It inspires me. It moves me to create something that well executed in my own home. Bravo! Most beautiful kitchen I’ve ever seen. Love everything about it. Sheer perfection! How is it possible to get so much awesomeness into one space? You guys did it. 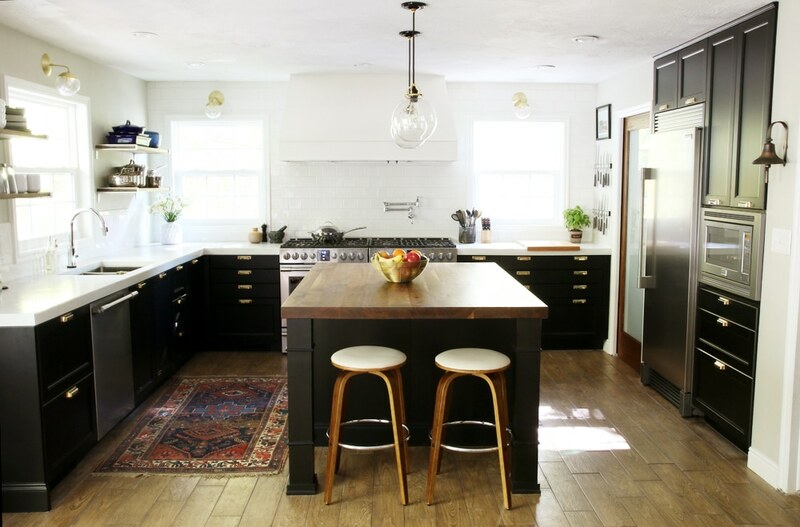 I love the black cabinetry and the island. They make such a statement against the countertops and backsplash. Every detail has been masterminded and accomplished. The best looking kitchen that I’ve seen in a long time! Hi. This is a beautiful reveal. The double stove and all-fridge are great ideas. It really takes a lot of thought to put good together. Quick question: are the bulbs in the pendants bright enough since they look like Edison bulbs? I thought the lumens are lower compared to the usual globe bulb. What kind did you use? These are 40 watt edison bulbs. Because they are right above eye level, we didn’t want anything too bright or blinding. 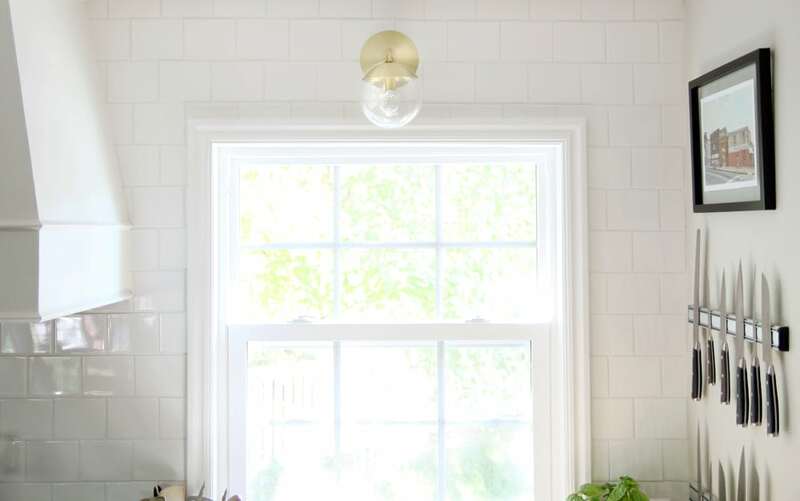 These give off a nice ambient light for the island, and work with the recessed lights, sconces above the window and hood lights to make sure the whole kitchen is well lit. As much as I am a die-hard fan of the classic white kitchen, I do love how you’ve executed dark cabinets while keeping it light. Looks great! I can’t stop looking at these pictures! It’s AMAZING! I was so sad for you guys when you left your beautiful kitchen at your last house and moved to the odd kitchen at the current house, but I think this shows it was worth it! So, so excited for you guys! You guys! This is absolutely amazing! 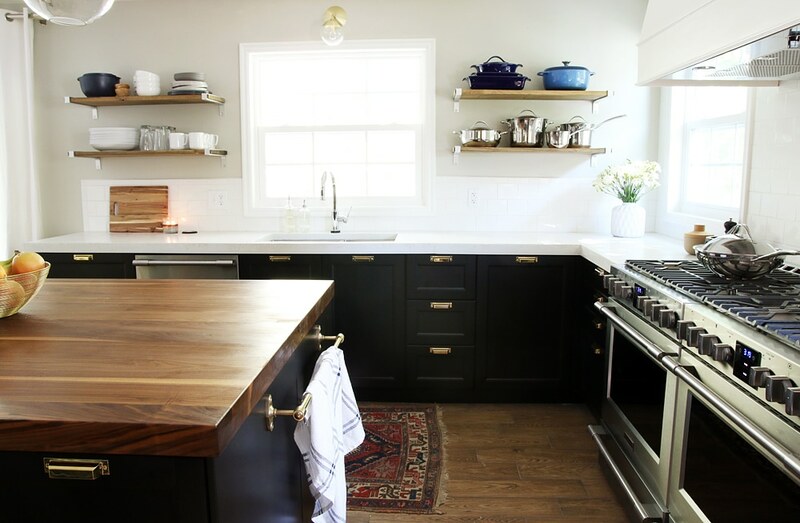 Love the way it all ties in, the wood on the open shelves with the island, the dark lower cabinets. The changes you made to the layout and the additional windows are perfect. I particularly love the photos of the kitchen in use at night. We gave our lumbar yard measurements of what we wanted and they ordered them for us. Absolutely stunning. Y’all made it look so cozy and welcoming but still a chef’s kitchen. Love all of your choices you made on the finishes, it totally suits your family and the look y’all have been achieving throughout the house. Yay! So excited, it is gorgeous! I love how it falls kind of masculine but chic. Would love closer up detail shots like of the shelving, knife wall with art, stuff on both sides of the double ovens! I have a dinner bell too! But only because I thought it was cute, no family nostalgia for me (sad face). Love the kitchen, your taste is mine that I cannot articulate (smiley face). Also, seven weeks?! Totally amazing. I’m resigning myself to months of microwave meals while we redo our kitchen! I have loved following this progress! Every touch is just stunning! Can you share the dimensions of the kitchen space and the new pantry. It reads so much bigger than the old space and I love the new layout! Amazing!!! So so beautiful! Thanks for all of your detailed posts about this project – I know it’s not always easy to stop for a photo shoot mid-project, but these posts were so informative and inspiring. Congrats on a job well done! wow, it’s just tremendous! Great job planning and executing. Wish you and your family so many happy times in the kitchen. It’s just stunning. Holy cow! That is one gorgeous kitchen! Well done!! so beautiful! i love, love, love how it came together! dying over those rejuvenation pendants. Once again, I am amazed and inspired! Great job Chris & Julia! FIST BUMP!!!! Love every single detail, and what a fantastic idea to put two ovens side by side! A million heart eyes for this kitchen!!!! You guys killed it. Dead. I’m dead. This kitchen has slain me. If the police show up at your door, you’ll know why. Tell them I said it’s okay, I died totally happy. Stunning, absolutely gorgeous! And 7 weeks! I’m completely amazed. I love the evening shots, thanks for including those. Loving your kitchen makeover!!! 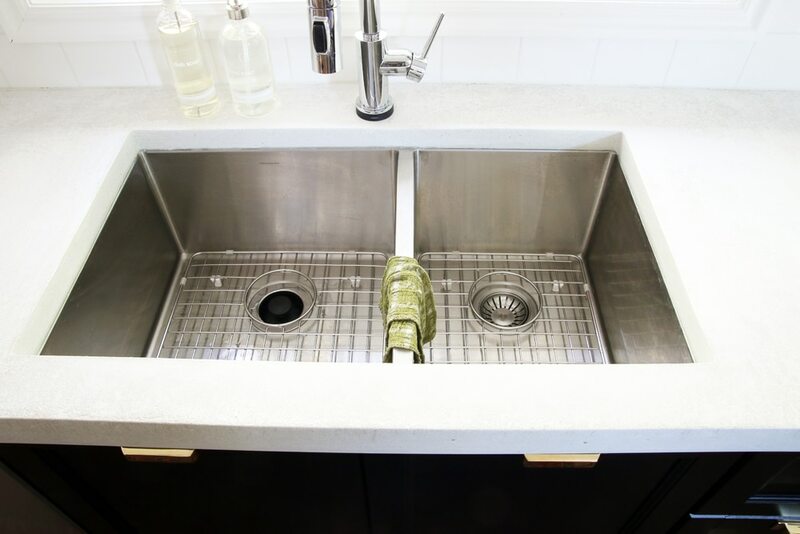 I can not wait to see how your concrete countertops hold up over time because I really want to add them in my home. I think the island brings the whole space together! 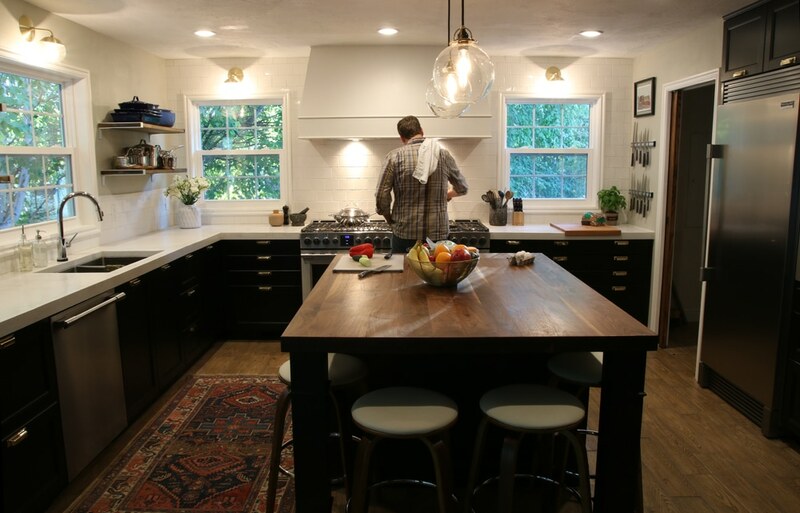 Wish I had the space for double stoves and an island…Great work, your kitchen fits your style now and I LOVE it!!! Man – if this isn’t a benchmark for how to do mixed metals right, I don’t know what is! Congratulations on executing your vision so successfully. I think you easily have the best kitchen of all the DIY blogs that have come before you (not that that was your goal). The side by side ovens was genius. And thanks for not being a slave to styled open shelving. I can do without whatever the latest Nate Berkus for Target gray accent vase is and just enjoy a kitchen that is beautiful for being perfectly functional. I love everything about this kitchen. Wouldn’t change one thing. I don’t think I’ve ever commented before but this sent me over the edge (which is amazing because I absolutely love everything you do!) Thanks so much for sharing the step by step process and always providing me with inspiration! Absolutely gorgeous!!!!! I didn’t originally love the hardware but seeing the whole reveal makes me totally love it!! And the double ovens are awesome too, great idea! Beautiful. Your kitchen shows incredible vision, great execution, and a perfect blend of aesthetics and functionality. I have really enjoyed following your progress through this entire renovation, and you guys have given me lots of inspiration. Enjoy your new kitchen! Oh. My. Goodness. It looks amazing!!!! You guys did such a great job – gorgeous! “Holy sh*t, they’re already done? !” was my first reaction, then I got real excited to settle in and see all the gorgeousness. You guys are seriously amazing and this space is just perfection. I love the mix of textures rather than colors and it truly is a chef’s kitchen. I bet Chris is on cloud nine cooking in there :) Beautiful job you guys!! You did it! And not only did you do it but you DID IT!!!! This is absolutly stunning! I love the gold accents, am thrilled with the tiling and those appliances…swoon! It’s the perfect balance between beauty and function. It’s a cooks kitchen all the way but so stylish it looks like you had a professional design it (but let’s get real here, at this point you are professionals). You have inspired me to look at my home in a totally new light. I really think I can do this!! Your kitchen makes me emotional. It’s that pretty. Cheers to you for all the hard work, for including us in so much, and for staying true to your style! Looks FAB! Really classy. I’m so curious about how you end up liking your concrete counter tops. You’ll have to give a one year review in the future. They look gorgeous and so does everything else. Happy cooking! I am so damn excited this is an Ikea kitchen! My hubby totally didn’t believe me and he is impressed how high end it looks! Thank You! Thank You! Thank You! For blogging the entire process and keeping your readers inspired! This looks absolutely INCREDIBLE!!! I love it, your vision was implemented perfectly. A question… You had originally mentioned four bar stools at the island, there’s only two pictured. Did they not fit? Just curious. Great job guys!!! You can see all four in the evening, real-life photos. For photos, all four in place drew too much attention to the stools I thought. I just swore like a sailor. From delight, of course! This looks too fabulous to accurately put into words. You guys have totally outdone yourselves. What a great and relaxing space! You deserve it! Enjoy! wow wow wow! Such an amazing space! Thank you SO much for including us all along the way. It’s breathtaking and it was super fun to follow along. Absolutely beautiful! It’s AMAZING. Utterly stunning. Congratulations! Overall: GORGEOUS!! Way to go! Your best idea by far is the 30” ranges next to each other. We just built our house a year ago; where were you with that idea then??!! Love the all-fridge idea. We have a typical fridge/freezer combo in our kitchen, then an all-fridge in our laundry room, and an all-freezer in our garage. So I guess I shouldn’t be envious since we have plenty of space, but I love the idea of just a fridge in the kitchen. Ours are so spread out. You are so lucky to have a nice walk-in big enough for fridges/freezers so close that it’s really part of the kitchen. Love the walnut island. Love all the lighting in the evening shots. Great job on customizing the island; from the pictures, it looks very professional, not DIY. Although you guys are practically professionals. Recessing the all-fridge was brilliant as well. Love the pocket door. The dinner bell works; so cute! Some things that I personally would have done differently… I’m still not on board with the gold trend. I’m trying, but I’m just not there yet. Those pulls are a little too office-y for a kitchen in my opinion. I would have made the range hood walnut to match the island and floors and inject a little color into the space. It’s so much white. Another trend I’m having trouble embracing. And I was so excited for the big backsplash reveal, then it ended up being typical white subway tiles. I would have loved to see some color, something truly different. But it is definitely timeless, and that’s important. I’m not a fan of open shelving for practicality purposes, but yours really open up the space. But like I said, overall, looks great. Much better than where you started, that’s for sure! Enjoy your new kitchen. Thanks for sharing your thorough review, Jen! I really appreciate it and it made me think about how we all consciously and subconsciously do that when looking at kitchens (or any space) online. I know we did the same thing when looking for inspiration for our own kitchen remodel–“Ooh I love those dark cabinets!” “But I prefer this hardware” “Something more classic for the backsplash.” We definitely don’t expect everyone to love every detail, just as long as we do. It’s what keeps life interesting! Jen, you did a great job of articulating your thoughts and I agree with you so much about two things. 2. I, too, do not like these pulls on these cabinets. 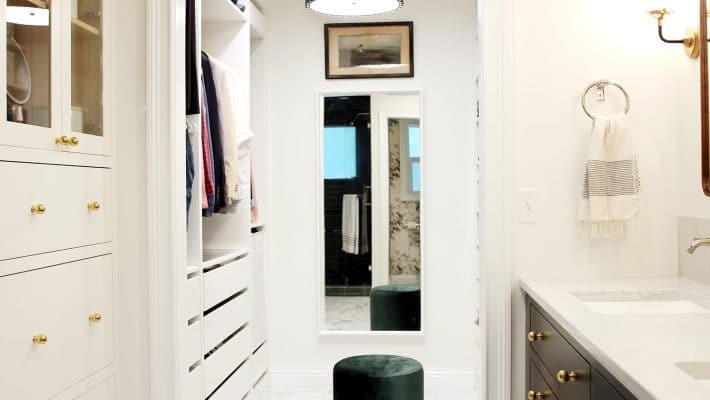 I have the same IKEA cabinet doors and drawers in white and found myself limited in what hardware we chose because there is just not enough room for some of the fancier options. In a different situation, I love the pulls Julia chose. 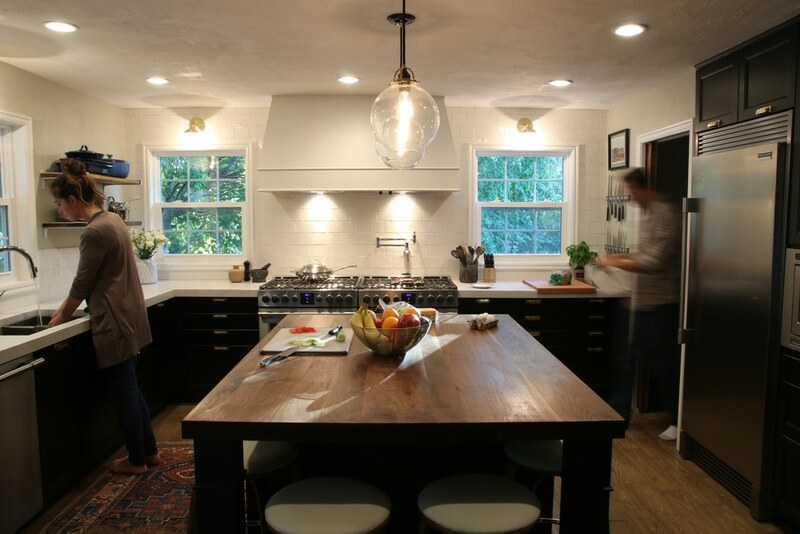 Things that I LOVE about Chris and Julia’s choices are definitely the choice to recess the wall around the cabinets, the changes and additions in windows (fabulous light, totally jealous), and the wood countertop on the island. I do wonder though, how the barstools are working with the type of legs that you’ve built since you have just two of the stools pictured in many of the pictures. 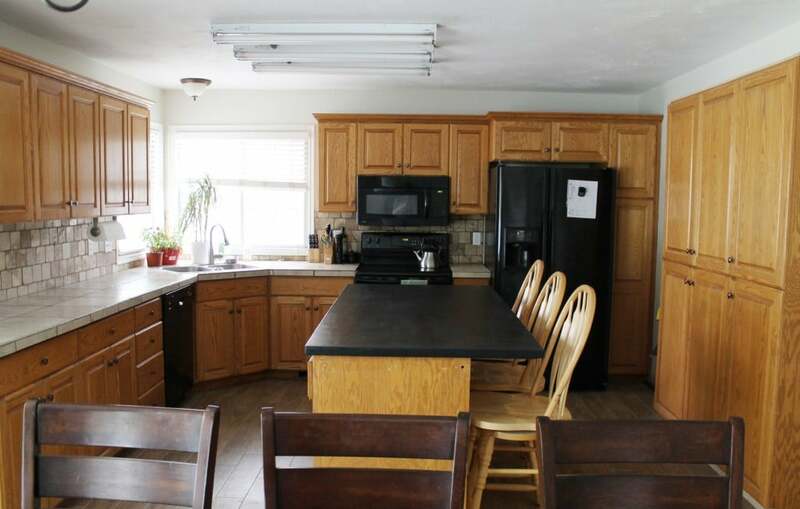 I have thought about adding a bigger overhang in our kitchen when we redo the countertops soon, but worry about the need for legs and how that will affect our use of barstools. We have four stools tucked under perfectly in real life–check out the evening shots to see that. For these photos, it just looked a little cluttered so we removed two to not draw attention to the stools. There’s plenty of leg room and we love how the casual seating doesn’t interfere with the three working sides of the island. You know, I’ll bet it’s difficult to really understand this room from the photos. I remember Julia saying that the ceiling height is a standard 8′ and that she and her husband are both tall people. 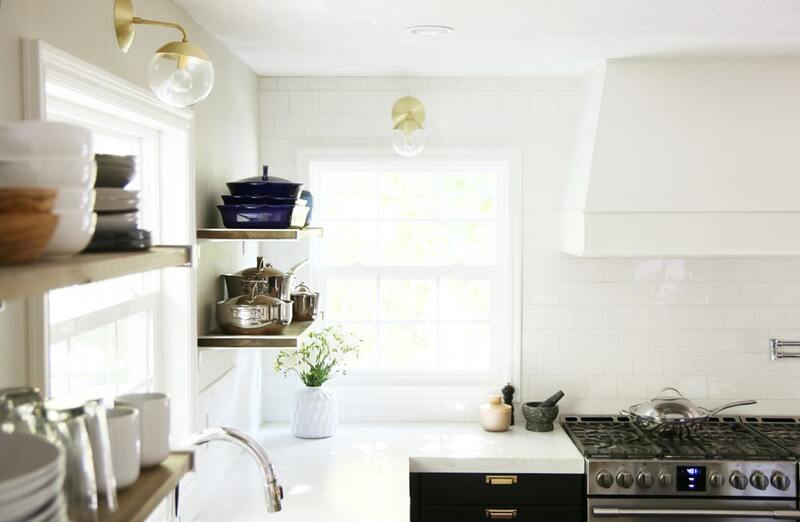 I can imagine that keeping the range hood white (the same color as the ceiling) really helps to make the room feel taller and helps them feel more comfortable in it. Remember that this room is actually really long when you consider the living room, dining space and kitchen together. A range hood that was more of a focal point would have probably made the room feel rather squat. I for one LOVE that the range hood kind of recedes into the wall/ceiling; my guess is that whatever the view is out those windows (green leaves!) is very much a part of the design plan, even though it doesn’t translate in the photos! Well, I certainly can’t say much about height! I’m 5’3″ and hubby is 5’6″. :) And our kitchen is two stories tall. I didn’t think about trying to make the space look taller and feel taller for tall people. I’m so so glad I stumbled across this awesome site. My husband and I are seriously considering an Ikea kitchen for our new home (building a farmhouse in VA this summer) and Jen, you pretty much have me convinced. And the double 30” ranges?! Brilliant. I’m copying. But do you have any more information on how you built your hood frame? This is the only thing troubling me…I don’t want the hood to take over the look of the kitchen. We have 9′ ceilings and I’m worried it will dwarf the room. But you are a foot shorter in ceiling height and the hood blends seamlessly! Can you provide a little more detail on your selection and the basics on construction (just wood type, if you used a template, etc). If/when you have the time! Until then I’ll keep staring at all your gorgeous kitchen photos/videos. You guys are incredibly talented! 1. Original supports Chris built to house the vent hood. 2. After the vent hood insert was in, we built out the supports in the shape we wanted the final hood to be. 3. We picked up 1/4″ birch plywood. It’s smooth, lightweight and doesn’t show grain when painted. 4. We cut the plywood to size and attached it directly to the studs with a nail gun. 5. We used the same pencil trim we added to the legs of our island to the hood. 6. Caulked all the seams and primed everything. 7. Gave it a couple coats of Valspar’s Soft Wool in eggshell. 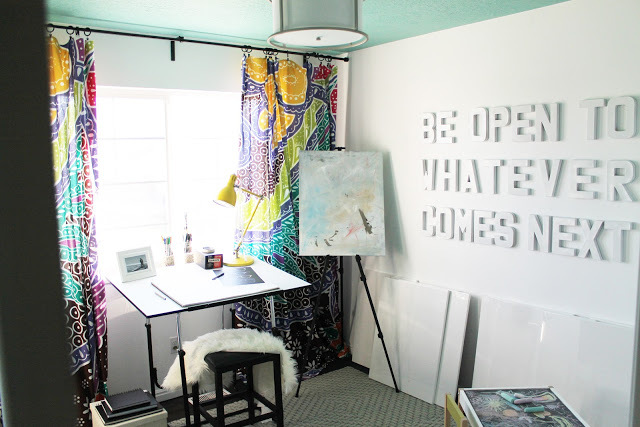 I think my favorite part of this room renovation is the juxtaposition of light and dark. The dark lower cabinets make the space feel grounded and substantial, while the white counters and walls make it feel open and wide. I can see how much you love this kitchen by your action shots, and all the fun photos you’ve been Instagraming. Finally, the finishing touches like the hardware and lighting and rug really infuse this room with your personality. Love it all! beautiful and inspiring–I want some longer shots of the whole open space from living room to dining room and kitchen and am curious how the laundry room door fits in too! The dinner bell = perfect quirk. And what is the photo above the knives? Aww, yes! The island is already proving to be quite the work horse and gathering space. It feels like home. Thank you for all of your inspiration and support, Kim! xo! wow – your kitchen turned out SO beautiful! Makes me want to redo mine (which is only 6 years old!) great job executing your vision! I love your kitchen! I can’t believe you did it in seven weeks! I love the black, white, and wood finishes and the way you mixed your metals. Those pulls and lights are just beautiful! Great job! I’ll be coming back for more inspiration! This is absolutely stunning. Such a handsome kitchen!! Stunning. I can’t pick a favorite part – I love every detail! Absolutely beautiful job. So on point, design wise. So good. So so sooooooo good *heart eyes*. I have loved reading and watching your kitchen come together! I have major kitchen envy right now, haha. Enjoy it guys! This is completely incredible! Every single detail is perfect! I also must to say thank you for NOT “styling” your open shelving. Function and beauty CAN intermingle and your commitment to that is one of the biggest reasons your blog is my favorite! Congrats on a gorgeous remodel! I’m so glad you said that. We originally hung some art above the shelves and it just didn’t sit right. This kitchen really is all about aesthetically pleasing function. Marcums for the win! You guys never never cease to amaze. It’s one thing to have great style and vision, but to execute it as perfectly as you do puts you guys on a whole other level. And you DIYed this space!! Talk about impressive! So inspired, so so happy for you! I want to cheer out loud when I see pics of all the work you’ve done!! You’re the sweetest, Corine! Come over for dinner every night! Looks amazing! One of the best kitchen makeovers I’ve seen!!! Wow! So so beautiful. 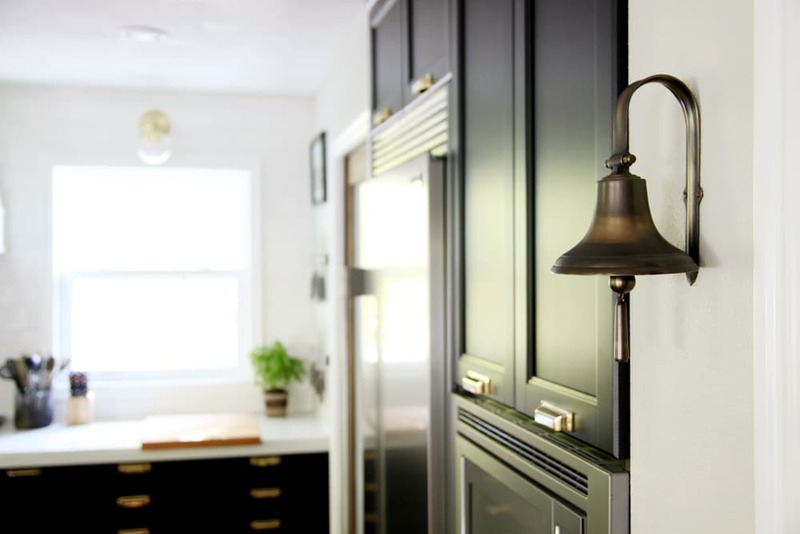 And I may have to borrow the dinner bell idea for my home :) I still can’t believe how quickly the reno was completed. Bravo!! Looks amazing!! I love the colour scheme, the layout and especially the rug! You guys did a fabulous job! I mean. This is breathtaking. It’s like you took the dream kitchen from inside my head and made it real. Looks so warm and inviting, looks great! I love the idea of an all refrigerator and we were considering a similar arrangement but the freezer would be a bit out of the kitchen. I see you have an all freezer in pantry, how does this affect grabbing ice, etc. throughout the day. It may sound silly, but we used a LOT of ice daily :) Curious on your thoughts. Thank you! It is really just a couple steps away, so grabbing ice or anything when we need it is no big deal. In fact, you’ll see that in the video next week! So so gorgeous! I’m so jealous. I’d love to hear more about the pocket door installation. We wanted to do some in our house, but it was in an addition that was up against an exterior wall, so we opted for barn doors instead. Really, such a fabulous kitchen! ENJOY! Since we were tearing down walls and such, it was pretty simple to add a pocket door frame. We picked ours up from Lowe’s. But leading into the laundry room, we have a sliding barn door–so we’re fans of both options! So awesome! Looks amazing and seems so functional as well. Enjoy you guys! I love this and I love how you kept us in the loop along the way! The only problem is that I REALLY want to redo my kitchen. WOW! I love how everything came together so perfectly! Is your microwave from ikea, or does it match the other appliances? We have a space in our pantry cabinets for one, and I am trying to decide which built-ins are best. Also, a suggestion for a future post is cabinet organization, and how the inside of the cabinets are configured. I know the sektion line has lots of possibilities, and there is not a lot of examples online for those of us that live a long way from an ikea showroom. Thanks so much for sharing your kitchen with us…so much inspiration! The microwave is Frigidaire as well. I’d love to do a cabinet post! We are actually still moving things back in so look for that in the future. Wow, wow, wow, that’s all I can say. Fantastic job, so beautiful!